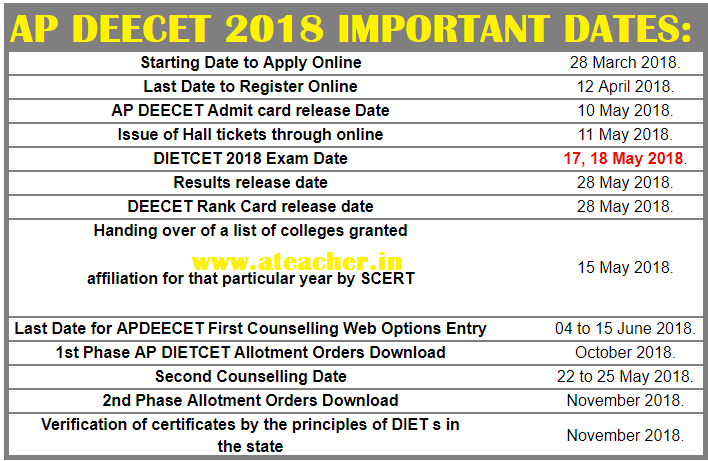 A.P DEECET 2018 (TTC DIETCET DEECET T.T.C 2018) Notification,Online Application, Fee Payment Details, Exam Pattern, Syllabus, Registration, fee, Eligibility, Exam date, How to Apply, Application form,How to Apply-Application form, Admission process, Answer Key and other details for AP TTC 2018.AP DEECET 2018 : Exam date, Notification, Online Application form, Eligibility, Fee, Important dates, Syllabus, Exam pattern, How to Apply-Application form, Admission process, Answer Key and other details for AP TTC 2018. AP DEECET Exam Dates 2018 @ apdeecet.apcfss.in,Andhra Pradesh DIETCET Important Dates 2018,AP DEECET 2018 – Details,Andhra Pradesh DEECET Counselling Dates 2018,AP DEECET 2018 EXAM Dates,AP DEECET Teacher Training Institutes (TTC) Exam Dates 2018. Click Here For G.O.MS.No. 1. Dated: 01-01-2016 . Click Here For G.O.MS.No. 22 . Dated: 31-03-2016 . Click Here For G.O.MS.No. 30. Dated: 08.07.2015 . Click Here For Download Submitted Application .